In March 2012, we expanded the collection of Distributome calculators, simulators and experiments. We are looking for the best (most-efficient, most-reliable, most-scalable, most-extensible) solution to this mapping issue. We expanded the Distributome experiments (13), simulators (19), and calculators (19). We are continuing to expand all collections of web-apps, enhance their functionality, integrate with other Distributome resources (e.g., activities) and improve the user experiences. There may be other LaTeX/TeX alternative symbols that may need to be used for MathJax math typesetting in hidden fields! We introduced a new Distributome.xml.pref file, which allows customization of the look-and-feel of the Distributome Navigator and Editor. One example of this customization is the ability to display hierarchically the Ontology of the collection of distributions contain in the Distributome XML DB. That is we have a mechanism to render the nodes and edges as 3 levels: Top, Middle or All/Complete levels (affording to the pref file). 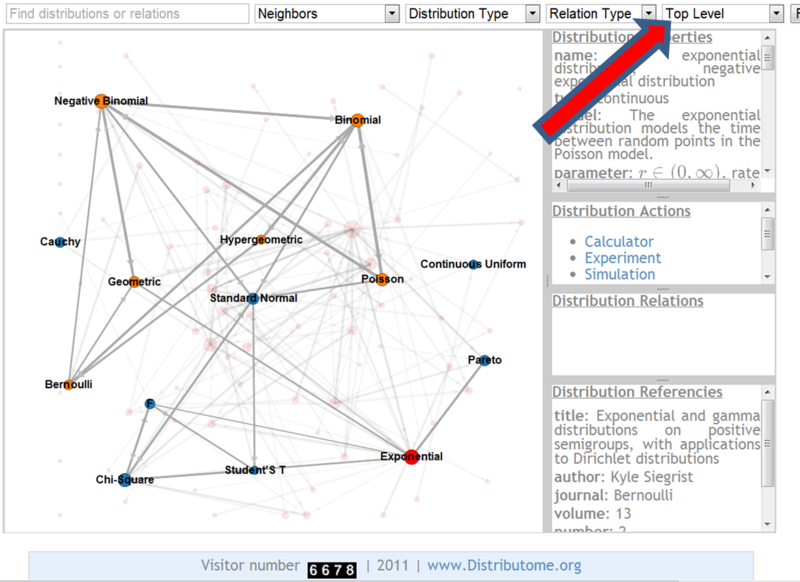 The figure below illustrates this new hierarchical Distributome Navigator display. 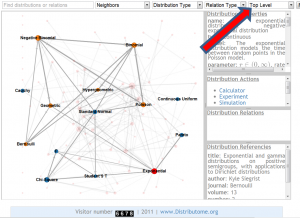 We have finalized the new format for the Distributome meta-data about (XML) distributions and relations (Distributome.xml) and (BiBTeX) bibliographical citations (Distributome.bib). There is a new Distributome DB/Meta-data HTML validator which renders the entire database, including references and citation URL links into a dynamic HTML webpage. Example HTML (Distributome_BibTeX.html) that interactively consumes raw BiBTeX source files, converts them to JS/JSON and displays the references in HTML page. An example of raw BibTeX source file (BibTeX_ExampleCitations.bib). These BibTeX sources can easily be obtained by users from the “Citation Download” or “Export Citation” links on most publisher’s web-sites (See this example). So, these BiB sources are very easy to copy-paste into the Distributome References Editor Panel from another web-browser-window. We decouple the references Section (Distributome_BibTeX.bib) from the main Distributome.xml DB, as the Distributome BiBTeX reference may increase to become very large (error prone). Thus we’ll need to have a way to reference publications (from Distributome_BibTeX.bib) into theDistributome.xml. This can be achieved by the DOI (Unique Digital Object Identifier) or the URL that every publication has. So inside the <cite>Publication_DOI_or_URL</cite> tag of distribution-nodes or relation-edges in the main Distributome.xml DB, we’ll just have pointers to unique DOI’s – the same unique DOI/URL will be available in the Distributome_BibTeX.bib source file. Hence we can pair the references by their unique DOIs/URLs. Then inside the Distributome_BibTeX.bib, each reference will have its unique DOI – this will enable linking of Bibliographic/references meta-data contained in Distributome_BibTeX.bib (on-demand) from inside the Distributome.xml and the Navigator, itself. This may be an easy, clean and scalable approach. the standard Bib/TeX syntax encoding the bibliographical references in the BiBTeX source. The Hierarchical Formatting of the search query results is done using JQuery Accordion mechanism. Working on an integrated “Distributome Search” functionality (with standard or advanced search features) that allows complete searching the entire Distributome Site, Wiki resources (e.g., Activities) and DB. Bibliography (Reference Manager) – we are still exploring BibJSON. Jim’s Distributome BibJSON construct looks great. We just need to figure out how to computationally consume (parse, read, load) and produce (revise, update, modify, save) these references programmatically. Looking for specific tools and examples of how we can accomplish these 2 operations from the Distributome site/webapps? Are there open-source HTML5/JS parsers for BibJSON and how to tie these with the Distributome.xml DB? Resource Debugging: For technical users, we’ve introduced an optional debugging functionality documented here. This is the infrastructure that we’ll be now populating. Distributome Editor: We are in the process of implementing the user-interface for editing the XML DB meta-data in the browser. Aiming to complete this in the next 1-2 months. 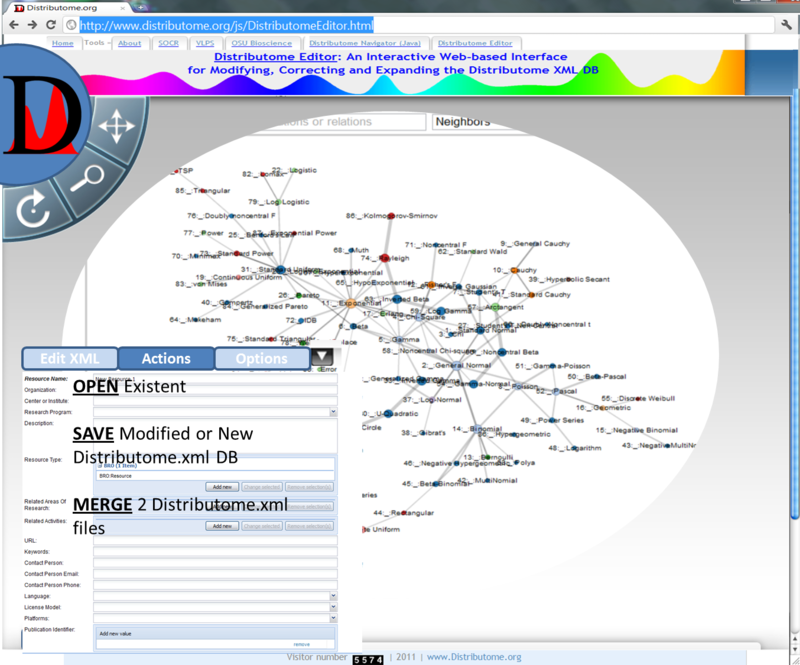 Distributome Navigator Layered/Multiscale View: Trying to simplify the Navigator view by introducing hierarchical multiscale rendering of the Distributome DB (nodes and edges). We’re working on this and the approach is to employ a new Distributome.xml.pref (preferences file) that allows specifying diverse run-time Navigator behaviors, incl. the hierarchy of Distributions/Relations to display. Please have a look at the current (15+15+All) list of 3-level hierarchy and let us know if we need modifications. This functionality will be live in the next few weeks.